Days passed, and then weeks. Roxi... Well, even if she wasn't sugar and spice and everything nice, Roxi behaved herself. She didn't bother me. She didn't bother Mum and Dad, either. She just ran around with her doglefox, Lucksomatic, or Lucks for short. And we were friends. Sort of. We respected each other, and even had a little fun. Like we had promised each other before, there was peace. Since Roxi was younger than me, we had no classes together. But we did see each other at the assemblies. Roxi sometimes let me sit next to her, not that her new friends (she was already quite popular) liked that much. "Eww, Rox, is he really your brother?" "I pity you, Roxi. Lucky my mom wouldn't let a creature like that into the house." The comments hurt. They bit into my skin like a swarm of hungry petpetpets. But I held on. And Roxi defended me, in her way. "Shut up, guys, he's my brother. Even if he annoys me. A lot." So I was grateful to her. Anyway, there was an assembly a week before Halloween. Roxi had already picked out her costume. She was dressing up as a princess. That didn't suit my sister at all. I think it was just a bit of a joke, all for the irony of it. At this assembly I sat down amid all the usual glares of disgust, murmurs, and cruel, girlish giggles. They all stopped when Ms. Glophi, who was now headmistress, took the stage. "Hello, boys and girls!" she cried, waving exuberantly. "Hello, Ms. Glophi!" the other kids chorused. I did not speak. "I have some very exciting news. Next week, on the thirty-first, we'll be having a Halloween party! You're all invited, from the tiniest JubJub to the largest Grarrl! Are you all excited?" A mixture of assents streamed out from my peers. I had no intention of going myself, of course. No one would talk to me, and I definitely wouldn't dance or play games or anything. I was planning to just curl up at home with a good book and a cup of borovan, maybe with some music playing in the background. I was daydreaming about what I'd do in the nice, quiet, Roxi-free lair of the house when that very girl jerked me from my imagined evening. "Oh, Manth! Won't it be fun?" It was her turn to stare. "I... I thought we'd be going together. You are my big brother, and I just..."
I stood up quickly. "No way am I setting so much as a tip of my hoof in there. A party? Really? Roxi, do you know me at all?" She seemed to shrink back into her seat. "I-"
"No." I wouldn't even listen to what she was about to say. I didn't know if it would be an apology or a plea, but I didn't want to be there to hear it. Over the next week, Roxi is pitiful. She begs me endlessly to come with her. She even buys me a costume, a wizard's cloak and hat. "What's this?" I asked when she handed it to me. I was scowling. Of course I knew what it was. "Your very own costume!" my sister squealed, hugging me. I flinched. "Didn't I already tell you? I'm not going to the party." Her face fell pretty quickly. "But..."
"Roxi, nothing you say can make me go." She pouted. I remained stubborn. When Halloween night came, Roxi was still begging me, and I was sick of it. "Why won't you go?" she asked me for the hundredth time. My mom looked at me and frowned. "Is this all because you don't have any friends? You could hang out with Roxi and her new buddies if you're too shy to make your own." She paused. "And really, Manth, she managed to find people to hang out with in a fraction of the time you've been going to Flipoll. I think you're just so unpopular because you don't try." That stung. Even if I had tried harder, no one would want to make friends with a zombie. I ran up the stairs. It was Roxi. I looked back just long enough to see her standing at the bottom of the steps, tears in her eyes. As I slammed the door to my bedroom, I thought I heard my mother saying, "Come along, Roxi. You don't want to be late." About ten minutes and a thousand pillow-poundings later, I started thinking clearly. I felt sorry for Roxi. After all, it wasn't her fault that Mum was being so nasty. I had stormed up the stairs, leaving her on the brink of tears. "Great," I muttered. "Now she'll never forgive me. So much for peace." But even if she wouldn't forgive me, I had to try. I had to apologize. Even though I would be late, I had to go to that party. I threw on the costume she bought me. Now that I wasn't ignoring it, I could admire how nice it was. The outfit was some kind of a soft blue cloth. I especially liked the hat, covered in stars. I rushed out the door and ran down the street, not wanting to be too late, not wanting to cause a commotion. Soon enough, I was at my school. The gym, where the party was being held, was packed. Streamers and decorations cluttered the walls, and some spooky music was playing. Pets were everywhere. But oddly enough, I didn't hear anyone talking. Looking up at the makeshift stage, I found out why. Mrs. Glophi was standing there, paws on hips, with a glare that seemed to be made of fire. "Children," she began, and even though that's a perfectly normal, happy word, it felt evil when she said it. "Children," she repeated. Trying to get a better view, I accidentally bumped into a faerie Gelert. I looked more closely at the pet I had knocked into. To my surprise, it was Lana Lore. She was my age and one of the most rich, popular kids in the school. And she was apologizing? She was normally one of the many that ignored me. Her best friends were Kelly Grove and Casey Loopi, a chocolate Draik and a woodland Peophin. Both fabulous colours. Lana was shoved out of my mind when Ms. Glophi spoke again. "As many of you most likely know, a nasty trick has been played on me." Here she grabbed a large piece of paper and held it up for us to see. I gasped. The picture- It was hideous. Well, in my opinion, Ms. Glophi is always hideous, though I guess you could say I'm biased. But that was who the picture was of- Ms. Glophi. But not just any picture of her. It was a poster for the party we were at right now, with her likeness rimmed with the monsters, witches, and ghosts of Neopia. I had seen many like it as I'd walked down the hallways the past week. But this one was different. Someone had taken a black marker and scribbled all over it, giving her a mustache, horns, and huge bushy eyebrows. And whoever it was had written phrases across the top like, "Ms. Glophi- Choosing Favourites? Get Her Out!" and "Tyranny in Flipoll Stemburg!" I could see why Ms. Glophi was mad. But all the same, I had to agree with the hastily scrawled words. "Who did this?" she practically hissed. 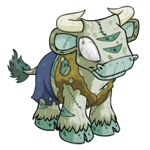 For a Poogle, she sure was scary. But I had long ago learned that you shouldn't judge pets by their colours- or their species. For some reason, it was my face she picked out of the crowd. "Jomanth Terriplot. Come here, please." I grimaced. I hadn't done anything. It was impossible. Nevertheless, I trotted up onto the stage. "I should've known it was you, you vile zombie. Thankfully, this girl here has reported you," she whispered, smiling at the pet standing slightly behind her. Kelly Grove. "Now go," she continued. "We'll talk about the consequences later." I left the stage in a daze. I spun around. It was Roxi. "Roxi? Did you do it?" I yelled, reminded of her first day at our house. I still wasn't sure what she had done. The important thing was that those days were over. Or so I had thought. "I didn't! Honest, Manth! I'm telling the truth." I could see tears welling up in her previously guilty eyes. I frowned, still angry. "Well, I don't really care whether it was you or not-" A lie on my part. Even though I guess she couldn't have known ms. Glophi would target me, I thought she was done with pranks "-But I'm going to find out who did it. And find proof."